Deb's Cup of Tea: To the Guild "mom"
The guy who got me to start my World of Warcraft guild paid real money to get me the item you see to the left. 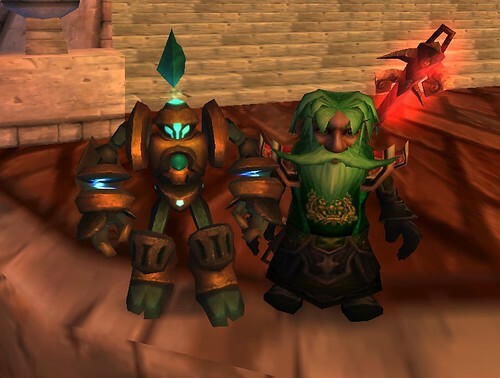 Bill has been my best WoW friend and the one person whom I have known the longest in this game. You go to the Blizzard store and can purchase a number of items that are exclusive to the store. There is a mount, which a friend bought for me, and two other pets, which is what this item is classified as. I received those as Christmas presents. Bill said this was for the "Guild Mom". I am really touched by this thoughtfulness. I would not be able to afford this and I rather enjoy collecting this kind of silly item. I'm not sure if Bill reads the blog but "thank you". That's Bill's gnome character, Bilmo, to the right. he bought that 4 u and it's sitting in your livingroom or your virtual livingroom? he's neat which ever way. It's an in-game toy. The only place I interact with it is in the game. It makes sounds and does calisthenics. It also has a very whiny voice. It's a take off on a boss in one of the grand dungeons. No one likes the boss because of the whiny voice. I'll have to see if I can get some video of the toy and of the boss. It's a testament to Blizzard's sense of humor to take an annoying boss and make a pet out of it.